With Eid coming up I thought what better gift than to create a DIY bracelet. It’s thoughtful and customized for the person you’re making it for. I had most of the supplies from previous projects but wanted some coloured beads for contrast. I came across some beautiful turquoise beads at a local craft market. When creating a bracelet or any jewellery piece I’m usually inspired by what I see in shops or online. 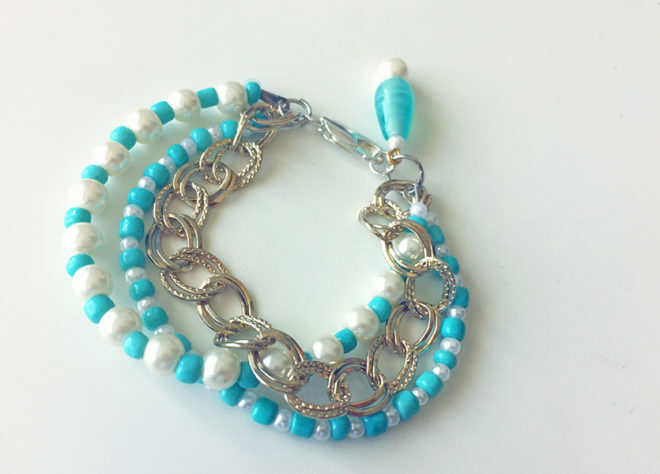 I recently bought a BB Tressors bracelet and that’s where the idea to mix beads came from. I also attended a jewellery making workshop where I learned the impact of layering different size strands to create more texture to the final look. These materials are all easily available on Amazon, Ali Express or at your local craft store. To start, make a loop with the fishing wire by having the pearl locked in the middle. Pull the fishing wire from both ends to secure the pearl. Trim excess wire from one side, leaving half a centimetre to attach the clasps later. Alternatively, string through beads and pearls to your desired length. Knot and secure with a pearl just as you did at the start. Trim the fishing wire, again leaving half a centimetre. Measure the circumference of your wrist (this design is for someone with a 6.5-inch wrist). Make sure the beaded line and the chain are the same lengths (in this case 6 inches, the remainder will be adjusted in the clasp) before trimming the chain. 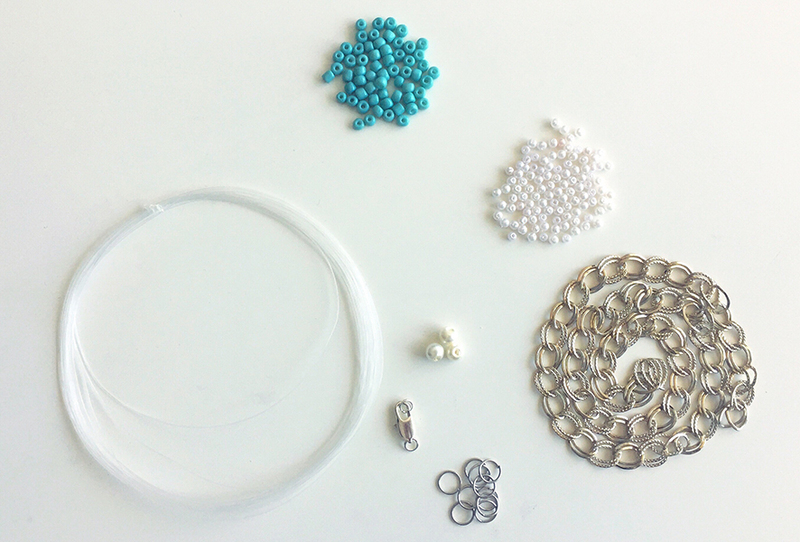 Attach keyhole clasps to both ends of the beaded strand. Loop the chain and the beaded strand into a jump ring. 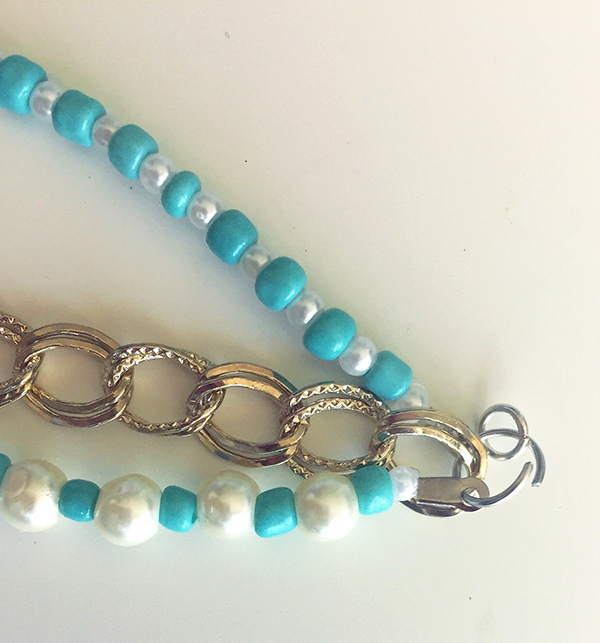 Create another pearl and beaded strand, complete with keyhole clasps and the same length as the other strands. This time change the small pearls for medium size pearls to give your DIY bracelet some different weight for added interest. Loop this new beaded strand into the jump ring with the other two strands and add another jump ring. Leave the big jump ring open to insert a charm. 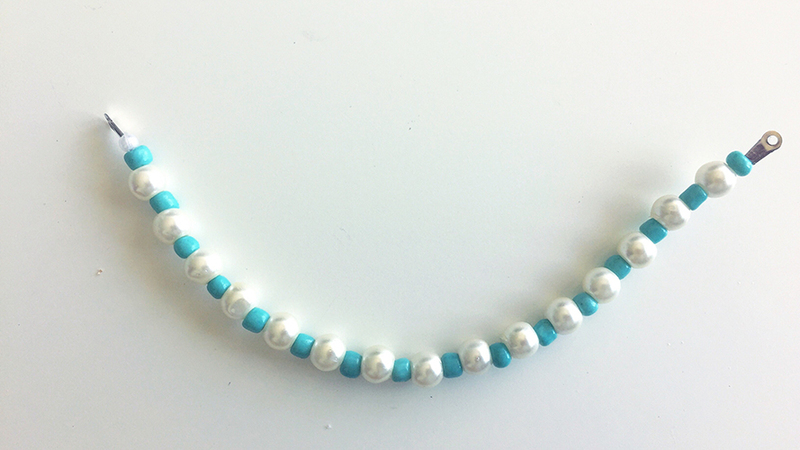 Take a head pin and three beads (a medium pearl, oblong blue bead and small pearl are shown here). Insert the beads onto the head pin. Cut the head pin using pliers approximately 1.5 centimetres above the last bead. This will allow you enough room to bend and curl the head pin to form a loop. Tadaa! – you’ve made your own charm. Use your imagination here and create any charm of your liking using this same process. Loop this charm in the jump ring you left open. Once inserted, close the jump ring. On the other end of your bracelet, attach a lobster clasp and you’re done! You should be very happy with whatever bracelet you create. This entire process is customizable to your style so have fun with it and share your DIY bracelets using the hashtag #DIYBaubleBracelet. Good luck! This was a very informative and helpful tutorial! I’m not a jewelry maker but my sister is trying to get into that so I’ll definitely show her this post! Thanks 🙂 I’m always excited to see pieces from new jewellery designers. I wish her all the best! I have no crafting bones in my body, but this look like a fun project! I really enjoyed in this post. That bracelet is so pretty. It’s amazing that you can any color you like. Bracelet is so awesome. Love to see all the process of making the Bracelet. Thanks! I hope it was easy to understand. This bracelet is very cute. Nice post of DIY. Beautiful! This looks like a fun project I could do with my daughter. I love simple jewelry pieces like this. The DIY bracelet you made is beautiful. Teal is one of my favorite colors. Thanks for the tutorial. This is an awesome diy. My kids will love to try this. Really creative and beautiful! I like your straightforward tutorial too. Definitely one to make for my girl.